Sheet Metal Punching vs. Stamping | Vista Industrial Products, Inc.
Those who are not familiar with the sheet metal world can often confuse the difference between sheet metal punching and sheet metal stamping. It sounds like one in the same since the two verbs sort of mean the same thing…right? This blog post will distinguish the difference between the two. A good reason to distinguish the difference is because the manufacturers of punching and stamping are almost always different. You wouldn’t go to a sheet metal fabricator who specializes in punching and ask for stamping, and vice versa. This is due to the different equipment involved in achieving punching versus stamping. As you can see, there is a clear difference between the two. 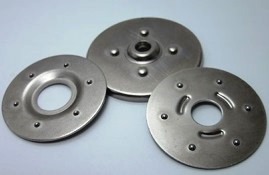 One is used to punch out specific features of a part like adding a hole or slot into a part. 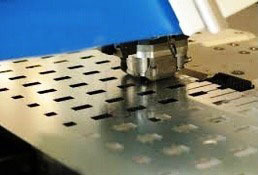 Whereas sheet metal stamping is used to stamp out an entire part with all features included. Both are used for different purposes (prototype vs. mass production) and require different types of machinery. Here at Vista Industrial Products, Inc., we specialize in precision sheet metal punching since we fabricate mostly low quantities to productions quantities. Once a customer of ours reaches mass production, we usually send them to a sheet metal stamping house in order to make their product more cost effective. We have six turret punch machines that have varying capabilities. We also have a plethora of punch tools in-house to choose from. For those customers that like to go for custom features in their parts, but don’t want to invest in costly tooling, we also have a high speed laser and a turret punch/laser combination machine. This allows us to laser out custom features if we do not have the in-house tooling, which saves money for our customers who are fabricating low to medium quantities. If you are looking for a high quality metal fabricator that specializes in sheet metal punching and laser cutting, be sure to contact us for a quote! Thanks for following along and stay tuned for our next blog post! This entry was posted in MFG, Principles and tagged laser cutting, metal fabrication, sheet metal punching, sheet metal stamping by Britney Blue (Payne). Bookmark the permalink.